Three news-aggregation pieces by Quin Hillyer at Liberty Headlines. Follow the links in the headlines for the full stories. John Neely Kennedy, Republican U.S. Senator from Louisiana, had some harsh and colorful things to say about some of his Democratic colleagues – and a pithy plea for Republican colleague Jeff Flake – in a Fox News interview on Wednesday morning. 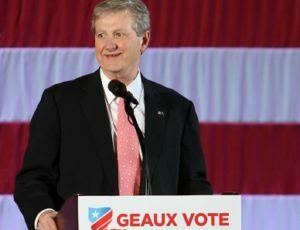 Sen. John Neely Kennedy, R-Louisiana, is taking shots at Citigroup and Bank of America for accepting taxpayer money while trying to restrict the Second Amendment gun rights of their customers. Kennedy last week introduced the “No Red and Blue Banks Act,” which would “to prohibit the federal government from giving contracts to banks that discriminate against lawful businesses based solely on social policy considerations.” Specifically, Kennedy is targeting the banks for anti-gun policies they have implemented this year….